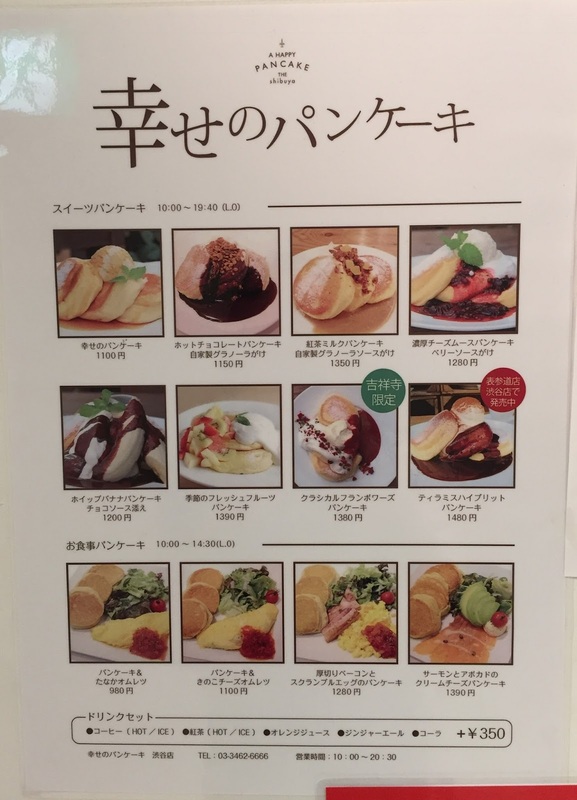 A Happy Pancake (幸せのパンケーキ, Shiawase No Panke-ki) is a chain restaurant specialized in pancakes. I heard there's always a long wait at any branches but they actually take reservations for weekdays only via phone, and I could get a spot for 10 AM slot, which is the opening time. When I booked, I asked how the reservation system would work because there must be already a line before the business hour. Then the staff said that they'd start calling the names with reservations first at 10AM before letting the stand-by customers. So I made sure to be there at least 5 minutes before 10 AM. I went to Shibuya branch, and it's a bit confusing to find it when I walked from Shibuya Mark City Exit though it's recommended. The restaurant is on the 3rd floor of the building on the left, and the right yellow sign is Matsuya, a beef bowl chain. Next to the elevator at the 1st floor, there're 2 notices. One on the left was precaution for the elevator use; get on and off quickly and not to stand by the door otherwise the safety sensor will be activated and the door won't close. The right paper asks to write your name and a number of your party at the 3rd floor to wait. Also, to serve freshly made pancakes, it'll take longer than 20 minutes and you can stay there up to 90 minutes so that more people come and enjoy the pancakes. When I got to the 3rd floor, there's a sign with instructions that they're opening at 10 AM and to write down your name and a number of your party on the paper. In case they'd use this paper to call names, I wrote my name and a number of guest, then added, "with reservation." I got there at 9:45 AM on a weekday, but there're already 6 people ahead of me. 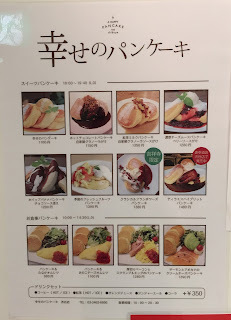 There're menus on the wall. At 10 AM sharp, a staff came out with a paper filled with guests' names with reservation, and I was called first and led to inside. I was alone and had a solo-diner table facing the window, which a kind of looked like a time out section. 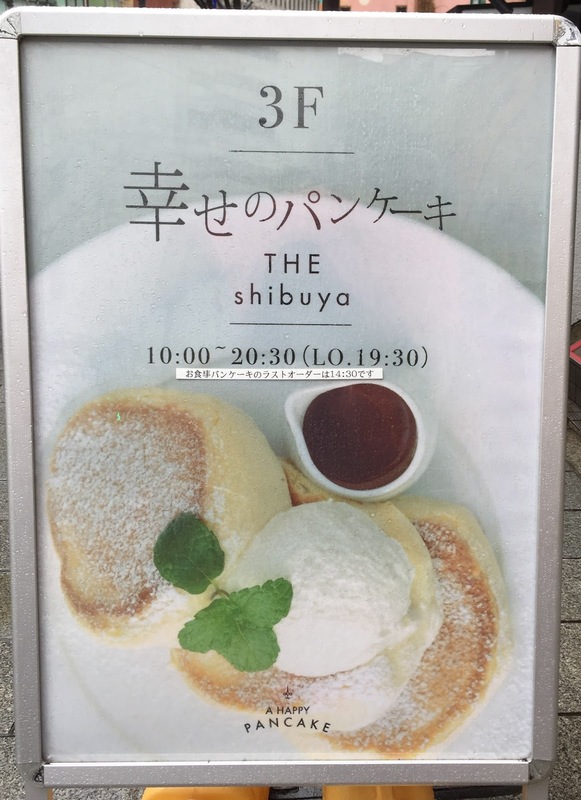 They have a special rule to serve pancakes that applies for the opening hour, and they'll serve pancakes to the customers based on order of the names written on the paper outside. Water is self-service and there're chairs and baskets to put bags near the tables. They have savory pancakes and you can order them till 2:30 PM. 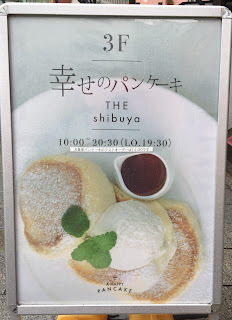 I ordered the simplest pancakes called "Shiawase No Panke-ki" at 10:03 AM. All the staffs had pleasant smiles and when I asked if I could take photos of the kitchen, they said, "Of course." There're about 7 or 8 electric hot plates and they're checking the temperature of each pancake. Some were mixing the batter, others were checking on the pancakes, and in the limited-spaced kitchen, they're constantly working. They said they'd serve pancakes to the customers who wrote the name first, but people who have reservations get them first as I got my pancakes in about 10 minutes. "Over the world's fluffiest and moist pancakes, there's whipped butter made from rich and creamy Manuka honey from New Zealand and cultured butter," and served with caramel syrup. It's about 12cm (4.72 inch) in diameter. You can see how bouncy the pancake was. I tried the pancake with the whipped butter. 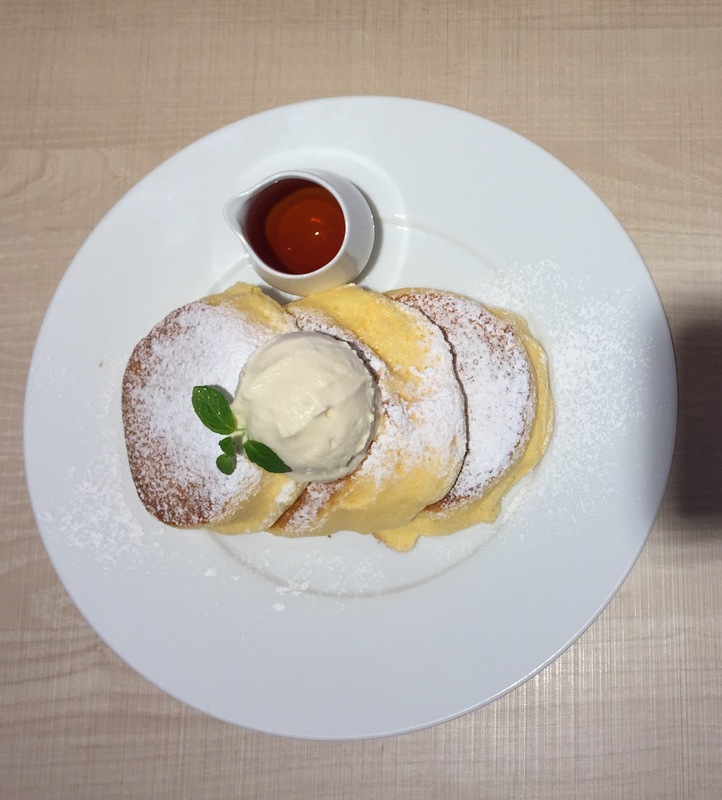 The pancake was as yellow as Castella (Kasutera, カステラ, a Japanese sponge cake), and the pancake was so fine and delicate that it melted away as if it's souffle with light fizzy texture. Though it's taller than 3cm (1.18 inch), it didn't ave any weight and I didn't have to bite at all since it simply disappeared. The whipped butter didn't have the characteristic manuka honey flavor but was full of fermented butter, and it added a good amount of sweetness and the pancake tasted good even without the syrup. For the 2nd and 3rd slices, I added caramel syrup. The pancakes started absorbing the syrup little by little. The syrup added a hint of fragrant scent and bitterness of caramel and it went well with the rich flavored whipped butter. If you could be seated right after they open the shop, you'll likely to wait shorter than the average to get the pancakes. And they take reservations for weekdays and it sure saves some waiting time. The bathroom was very interesting. It's behind the TOILET sign. How to go to the restroom.